These are actual questions that have been asked. "WTC Cliff Notes" provides a brief overview of the site. These are not "space beams." Lightening arcs across an energy potential between two points (ususally cloud-to-ground). Tornados also connect across an energy potential, but of a slightly different form. Here is a video showing a tornado forming from the ground up. 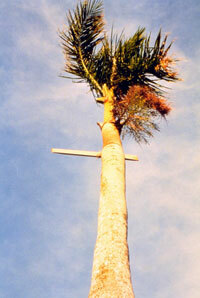 It is an excellent example of how tornados result from field effects. Tornados "strike" more slowly than lightning. And similarly, hurricanes "strike" more slowly than tornados. 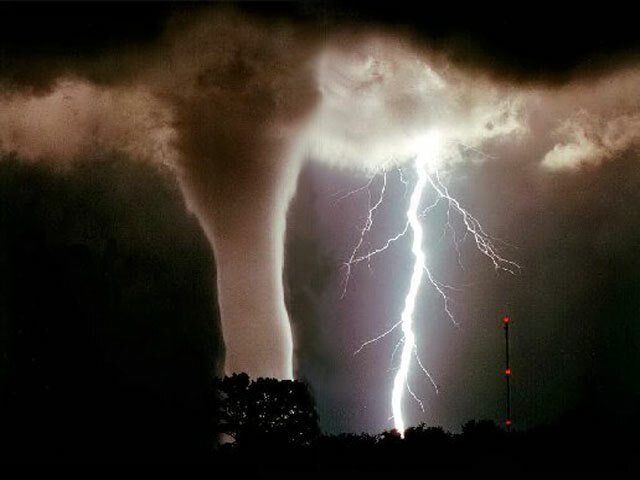 Note that lightning accompanies tornados and hurricanes, which also contain lightning, can have tornados emerge from them. F. What explanations have been suggested to explain these phenomena? Is your "space beam" hypothesis testable? Why was "Star Wars Beam Weapon" used as the title for that paper? Why do you think we need it for 9/11? What can't we explain without it? Don't the reports of explosions undermine it? Can't thermite/thermate do the whole job? If thermite/thermate could do the whole job, wouldn't it be the simpler and preferable theory? How do we know they even exist? Why do the "toasted" cars matter? Why does the bathtub matter? Why care about the speed of destruction? Can you construct a destruction simulation? Where would all that energy come from? Is your hypothesis like "aliens did it"? If your theory is so flaky, why is it being attacked to viciously all over the place? What hypothesis, precisely, are you willing to commit yourself to at this stage of research? Steven Jones and Greg Jenkins say it would take five times the earth's energy output to destroy the WTC. So, doesn't that mean that you've been debunked? Exactly how much energy would be required to pulverize the WTC towers? Why do some people (i.e. Steven Jones, Donald Rumsfeld, Richard Myers) get so nervous when asked about directed energy weapons? Is it possible that some of the mass of the towers was converted to energy (E=mc2), and if so, does this help satisfy the energy requirement problem? A bright glow is observed on several videos, occurring about the time the disintegration of WTC1 is finished and the mushroom cloud is well formed. Do you think this is something real, or just a video artifact of some sort? You've coined the term "dustification" to describe what happened to the towers. Can you define this? Could the 47 massive steel columns (in each tower) have fallen in the sub level basements? Could this be the reason it's not visible in the photographs? If not, why not? Why was WTC 6 pulled with cables? What about the sound of explosions? Were there explosives planted in the building? What about the "molten metal"? What about "fires lasting for 99 days"? You were "caught on tape" saying that we should not get distracted by numbers when asked exactly how much energy would be required to destroy the WTC. Is this true? That video of you with Greg Jenkins really discredits the "truth movemnt." Shame on you. Richard Gage claims the hypothesis or theories of "Dr. Woods" are unsupported by the evidence. Is this true? Richard Gage claims Dr. Wood doesn't use the scientific method. Is this true? Does the "article" posted on the ae911truth website refute your work? Richard Gage claims Dr. Wood overlooks the existence of nanothermite. Is this true? Richard Gage claims Dr. Wood ignores or overlooks the existence of iron microspheres. Is this true? 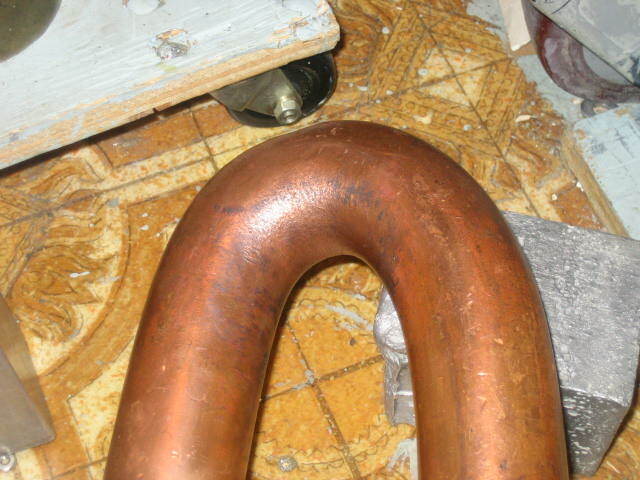 Richard Gage claims Dr. Wood denies or overlooks the existence of molten metal. Is this true? Why doesn't Dr. Wood write refutations of all of the refutations claimed against her work? First of all, I have never used the term "space beams." It is a derogatory term used to distract folks away from looking at the real evidence. The term was first coined by physicist Steven E. Jones within days of my first posting an article suggesting a high-tech energy weapon was used to destroy the WTC. It has been speculated that the purpose of using this name was to mock the hypothesis that unconventional methods were used to destroy the WTC. At this point, it has not been determined exactly what weapon was used, but the general category of what was used is fairly clear. The visual data as well as the issues related to the bathtub fragility and ground shaking eliminate the conventional demolition methods that have been proposed to date. The buildings floated to the ground as dust. So, is this hypothesis testable? Yes! And each of the phenomena identified at the WTC complex on 9/11 has been reproduced in a lab. We present this evidence here. This may or may not be the exact same way of creating the effects, but it is the same mechanism. Why was "Star Wars Beam Weapons" used as the title for that paper? This term was used because it is a familiar term that has been used over the last 20+ years to describe weaponry under development as part of the Strategic Defense Initiative (SDI). Since little is known about the technology specifically, though numerous articles and Defense websites describe its existence, plus the fact that hundreds of billions of dollars have been channeled to research in this area, it is reasonable to expect that tremendous advances have been made in technology over the past 50 years since microwaves and lasers were first developed. (brought to you by the Star Wars Program)"
after I learned that such a class of weaponry was known to exist. That is, the evidence led me to this conclusion before I knew there was a name for it. I have used the terms "beam weapons" and "directed energy weapons" to refer to unconventional weapons (exotic weapons) that are energy weapons. I broadly define DEW as Energy that is Directed and is used as a Weapon. The full range of these weapons is classified information, so I make no limits or distinction of categories within the realm of energy weapons, as doing so would imply specific knowledge of all that is available. In the following paragraph, I have listed some of the possibilities we are aware of. My critics have accused us of insisting that beam weapons did their damage from outer space, yet I make no claim about whether the directed energy weapon operated from a space-, air-, or ground-based platform. Nor do I make any claim about what wavelength(s) was used, what the source(s) of energy was, whether it involved interference of multiple beams, whether it involved sound waves, whether it involved sonoluminescence, whether it involved antimatter weapons, whether it involved scalar weapons, whether it involved HAARP (more here and here), whether it involved a nuclear process (e.g. NDEW, more info), whether it involved conventional directed energy weapons (cDEW), whether it involved improvised directed energy weapons (iDEW), nor what kind of accelerator was used, nor do I claim to know what the serial numbers of the parts that were in the weapon(s). What I do claim is that the evidence is consistent with the use of energy weapons that go well beyond the capabilities of conventional explosives and can be directed. Its not a matter of need. Its a matter of evaluating the available visual, ground shaking, and structural data. Though it is common knowledge that the laws of conventional physics were violated, the credibility of the physical and observable data to develop theories that withstand all observations is critical to the integrity to any conclusions. If analysis of this type is not undertaken, fraudulent research could be easily debunked, thus discrediting honest researchers and allowing the perpetrators to continue undeterred. There are many pieces of physical data that are unexplainable by conventional theories. The low levels of ground shaking of the towers when compared with comparable structures/levels of shaking and the fact that the buildings did not collapse outside of their own footprint means they should have acted like a pile driver on their foundation, the force of which would have destroyed the structure and caused flooding of the WTC complex and lower Manhattan subway system. Don't the reports of explosions undermine what you are saying? No. The sound of an explosion does not automatically prove the sound came from a bomb. Not all explosions are caused by explosives. Cook a raw egg, still in the shell, in a microwave oven and you will hear an explosion. There is testimony from first responders about their Scott Packs "going off" and "exploding." After all, if the pressurized air tank, made of metal, is dissolving, at some point the metal tank will no longer be strong enough to contain the pressurized air and the tank will explode. As both proponents and opponents of government complicity indicate, one cannot be sure that all testimony is valid. The observations of physical evidence via videos and pictures are far more reliable for determination of those theories that are and are not supportable. Thermite/thermate is an incendiary which may be able to cut steel, but could not account for the explosive destruction of the cement and other building materials in the building. Though supporters of this theory contend that it could potentially do the whole job, no modeling of these methods of demolition have ever been produced. The observations of tremendous precision in the destruction of the towers as they floated to the ground would appear to be far too precise for an incendiary. Further, the observed toasted cars, at great distances from the WTC complex, are difficult to explain with thermite/thermate. Also, unburned paper, missing windows and door handles of vehicles in proximity to the complex contradicts the thermite/thermate explanation and cannot be explained by it. Simpler is one thing, explaining all the physical evidence is quite another. Bubblegum is a simple theory, but does not explain the evidence. Although the use of these incendiaries should be tested, evidence postulated to support the theory does not stand up to the visual evidence. That is, there is no evidence of tremendous burning infernos in the subbasements of the WTC towers. Photographic evidence on the days immediately following indicate no such heat. A person observed climbing into the subbasements as well as observed liquid water would tend to refute urban legends that pools of molten metal existed there. No evidence of search personnel being burned or overcome by heat have been found. Further, when the buildings came down, persons running from the scene were not burned by super-heated debris falling to the ground. The air was filled with dust and loose papers. The dust was dense enough to block out the sun, but it was not on fire. Such high-tech weapons are classified and are not public knowledge. This does not mean they do not exist. However, as noted previously, piecemeal evidence of their existence exists in news briefings of defense personnel (including Defense Secretary Donald Rumsfeld), defense websites, and other defense contractor websites. It is common knowledge that recent Administrations have made weaponization and total dominance of space a priority. Countless billions, if not trillions, of dollars have been budgeted for space weapons development as part of the SDI program noted previously. As noted previously, this has been accumulated via numerous sources to paint the picture that they do exist. Further, past developers from government labs have indicated that they were involved in their development as far back as the 1960s. Though science fiction has fantasized about DEWs since before the 50s, microwaves and optics (lasers) have been available since that time. That their further development could not have exceeded what is currently available in industry and at academic research institutions is not likely since typical military technology advances are 15-20 years ahead of that which is known on the street. The term "toasted" (as in "toasted cars") is a generic term used for the odd destruction seen on vehicles around southern Manhattan, but is not limited to vehicles. A "toasted" vehicle means, "That vehicle is history; it's toast." It's a general term for an unknown process and does not necessarily imply heat. The toasted cars matter because they are observable evidence. If a theory cannot explain all the evidence, then it must be incomplete at best, incorrect at worst. That other theories do not explain this phenomenon lend credence to the explanation of DEW which could easily explain this through reflection and refraction of directed energy at the WTC site. The foundation of the WTC towers were build on bedrock below the Hudson River. The bathtub served as a dike to hold back the Hudson River. The bathtub matters because its lack of damage is evidence. Remember, 500,000 tons of debris were supposed to have fallen in roughly the footprint of the towers, according to the OGCT. 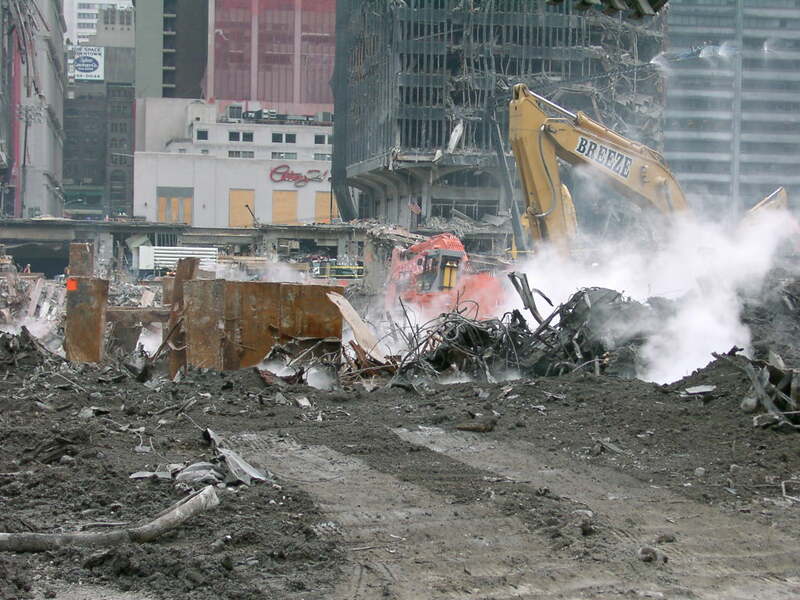 Since debris did not pile up outside the footprint of the towers, either the debris hammered down on the bathtub or it disappeared in a cloud of dust (observed). That there was no damage to this fragile layer of reinforced concrete at the very base, in the bathtub, when there is such total devastation to the concrete within the structures themselves, is horribly inconsistent. The fact that failure of this structure would have led to the flooding of the subway system in lower Manhattan is another reason that its lack of damage is significant. Pulverization matters because it requires an energy mechanism that allows the building to be destroyed without destroying the bathtub. 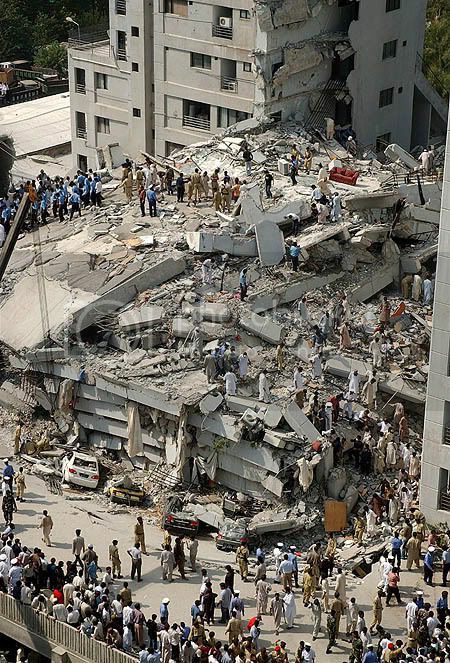 Further, it is consistent with the lack of ground shaking that would be expected based on the mass of the buildings and the footprint within which the debris should have collapsed. Further, it explains the tremendous dust clouds and layers of dust found over many square miles of Manhattan. Last, it explains the lack of damage to neighboring structures (WTC 4, 5, and 6) due to falling debris which is not found in the vertical damage there. Non-WTC structures showed little damage except for one vertical cut in one building and some dust, minor debris, and broken windows elsewhere. The speed of destruction is important because even other conventional methods (or proposed methods in the case of thermite/thermate) would have considerable difficulty in producing the destruction times that were noted (nearly at freefall speed in a vacuum). By eliminating other methods of demolition, the focus can turn to the totality of the evidence that cannot and has never been explained by conventional means, not to mention the OCT.
A destruction simulation can be created, though not knowing the specific properties of what exactly caused the destruction, it will not be perfect. What was used has never been acknowledged to exist in source information within the public domain. DEW weapons are thought to still have top secret desginations for the most part, however some are now acknowledged to be either in existence or in production. It is evident in all of the visual pictorial evidence. That this evidence has not been taken into account to this point (vertical holes in WTC 5 and 6 and WTC3 between collapse of the Twin Towers, the toasted cars, the lack of damage to the bathtub, ...and low levels of ground shaking related to the building mass and footprint) is all the more important in that the evidence can be explained by technology the Pentagon has indicated it is pursuing, but has not publicly acknowledged that it has deployed. It can also be assumed that other countries have made similar advances. Each of the phenomena identified at the WTC complex on 9/11 have been reproduced in a lab. We present this evidence here. This may or may not be the exact same way of creating the effects, but it is the same mechanism. As noted previously, the visual evidence provides the best description of what happened. Look at all of the various anomalies pointed about by the research shown (here, here, here, and here). Note that all anomalies can be explained by this mechanism. The fact that other theories have already been debunked by NIST (thermite/thermate, bombs-in-the-building) and the fact that it is a physical impossibility that the buildings turned to dust on their own through fire-induced collapse, some source of energy was utilized. The vertical holes in WTC 5 & WTC 6 are very incriminating. No debris is found in the holes and they are perfectly vertical like the Etch-A-Sketch lines drawn on the famous children's toy. Something removed this material in (approximately) 24 foot swaths. Something broke down the steel, concrete, and other building materials in the Twin Towers symmetrically and at freefall speed in a vacuum. No other explanation has been given for this. The buildings and their contents were turned to dust. They were not vaporized or melted. The energy may not be as tremendous as needed to vaporize or melt the masses of the two towers. It may be analogous to a microwave oven in that certain electromagnetic or sonic waves are used to excite the specific materials in the buildings to allow them to turn to dust without heating or vaporizing. Remember what we saw, not what theoretical known science tells you how to interpret what you saw. The sources of this energy may be from solar collectors in space or transmitted from ground based sources using transmission in the atmosphere with aircraft or satellite technology. No, it is based on known technology, known research on SDI, the amount of investment in such research, the progression of known technology and optics, and above all the visible evidence. The visual evidence is key and eliminates other forms of technology. That is a great question. Please note I present evidence, not a theory. But even if it were, when you think about it, then it's a "theory" that explains all the visual evidence is called "flaky", yet is attacked visciously, though is not debunked. It is simply called crazy and looney. As most Truthers should understand by now, the more something is attacked, the more likely it is that this researcher is on to something. The hypothesis that the WTC buildings were all destroyed in a way that has never been seen before is consistent with the use of Directed Energy Weapons. Are the towers still there? If they have been destroyed, then obviously there was enough energy to destroy them in the way they were destroyed. Does Steven Jones or Greg Jenkins believe the towers are still standing? To say that it would take more than five times the earth's energy output to destroy the WTC, then say that thermite did it, are they claiming that the thermite came from off planet? The gravitational potential energy (PE = mgh) is not enough to destroy the WTC towers. More energy is needed. But, the energy required to destroy the building would depend on the mechanism involved. Yes, it is possible. WTC1 is finished and the mushroom cloud is well formed. Is this something real, or just a video artifact of some sort? This is difficult to say. Again, not knowing specifically what it was that destroyed the towers (again, there is no debate that they buildings were widely converted to dust, not rubble) it is difficult to know if that was a video artifact or an actual piece of evidence. The buildings were turned to dust. The exact mechanism is not known, but it is known that there was such a process. The term, dustification, is given to refer to this, yet-to-be-defined, mechanism. 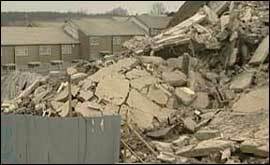 Dustification means that the buildings were not melted, evaporated, or turned to course rubble. It is a known fact that the contents of the Twin Towers were converted to very fine dust that covered much of lower Manhattan several inches deep. 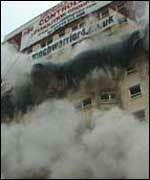 It can be seen as the buildings came down that the mass above the demolition wave is no longer there, is not falling past the demolition wave and is not in its original condition. Where did it go? All that is left is a giant cloud of dust that moves with great force throughout downtown Manhattan and drifts away with the wind. No hot embers were noted anywhere in Manhattan as seen by the loose sheets of paper everywhere that are not burning right next to the toasted cars that are. What would have caused them to collapse at the bottom? Did we see the bottom of the building pulling in at the same time the top of the building is coming down? Could all of the floor truss connections all have failed at the exact same time? This is highly unlikely due to visual evidence. There are massive open holes in the sub-basements that cannot be explained. If the core columns were in there, wouldn't there mass have filled much of the holes that existed post collapse? Again, look at the visual evidence and see for yourself. In addition, a video of the first rescue workers going into the basement records an obvious echo, indicating the basement had large open areas. Figure 16. 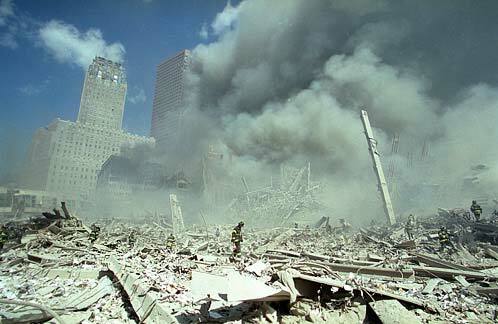 First rescuers under the WTC remains, "someone down there-there-there..."
That is a good question. However, the proper parties to ask are those who did it. The proper parties to have done the asking were NIST investigators and other governmental investigators. To my knowledge, the governmental investigators did not do so. The sound of an explosion does not automatically prove the sound came from a bomb. Not all explosions are caused by explosives. Cook a raw egg, still in the shell, in a microwave oven and you will hear an explosion. There is testimony from first responders about their Scott Packs "going off" and "exploding." After all, if the pressurized air tank, made of metal, is dissolving, at some point the metal tank will no longer be strong enough to contain the pressurized air and the tank will explode. There has been no evidence of molten metal found at the WTC complex. The evidence actually contradicts the possibility of molten metal (of any significant quantity) during and after the destruction of the WTC, from 9/11 onward. · The West Side "Lake"
· Molten Metal? Where is the Steam Explosion? There has been no physical evidence of actual fires (or smoldering fires) at the WTC complex after 9/11. However there was (and continues to be, but to a lesser degree) evidence of "fuming," which is consistent with molecular dissociation. 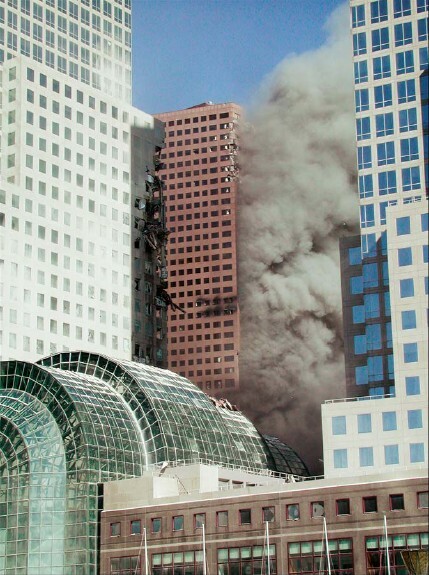 · Workers at Ground-Zero in "fuming haze"
Yes, I do believe it is a distraction to focus on "numbers." What is the purpose of these "numbers"? Do you wish to prove the towers are gone? Or do you wish to prove that the towers are still there? Why not just look and see? It is curious why Steven Jones has insisted that I produce such calculations, but has made no such calculations for how much thermite would be required, nor how much thermate would be required, nor how much superthermite would be required, nor how much nano-enhanced thermite would be required, nor how much spray-on thermite would be required, nor how much of whatever he is now proposing would be required. A manipulated video has been promoted on the internet that is equivalent to drawing a mustache and devil horns on my photograph. This does nothing to discredit me or my work. If this video concerns you, perhaps you may want to ask the individuals promoting it what their motivation is and if their motivation is to discredit the "truth movement." You may also want to ask those promoting this video why this video is so important to them. Mr. Gage claims the hypothesis or theories of "Dr. Woods" are unsupported by the evidence. Is this true? First, the name is Dr. Wood, not Woods. Presenting correct information to the public is important for one's credibility. In my book, I only present evidence and discusses evidence and analyzes evidence of what happened on 9/11. Empirical evidence cannot be "wrong." And no, empirical evidence is not a "theory." I present empirical evidence of what happened on 9/11. The measurement of someone's height is evidence of their height and is not a "theory" or a "hypothesis." It appears that many use the term "hypothesis" as a way of discounting or denying the evidence I present. If someone fails to understand the difference between "hypothesis" and evidence, it brings their credibility into question. Mr. Gage claims Dr. Wood doesn't use the scientific method. Is this true? I am a scientist and have followed scientific methods in conducting a comprehensive forensic investigation of what happened on 9/11. The first step in a forensic investigation is to determine what happened. What happened is not a case of belief. This is a crime that should be solved by a forensic study of the evidence. Before it can be determined who did it, it must first be determined what was done and how it was done. Mr. Gage has not conducted a comprehensive forensic scientific investigation and determined what happened on 9/11. Instead, he has continued to call for "a new investigation." But a comprehensive and independent forensic investigation does exist, comleted by a highly qualified forensic scientist, but Mr. Gage refuses to read, analyze, or address this investigation which is in the book, Where Did the Towers Go?, but stated he would look at it. The question becomes with a "new investigation" that he proffers continuously, why has he refused to read this "new investigation" by Dr. Wood if his real goal is the determination of the truth of 911? Not only does Mr. Gage refuse to read the comprehensive forensic investigation of what happened on 9/11, he removes members from his organization who do. Someone who publicly claims that I do not follow the scientific method brings their own credibility into question. More cases are presented here. I just recently checked your website and saw that my profile has been added to the degreed engineer petition list: http://www2.ae911truth.org/profile.php?uid=973060 I also see that my supporting statements about Dr. Judy Wood's work have been removed from my bio section despite the disclaimer at the bottom of the user profile pages: Disclaimer: The personal views expressed by Supporters in their Bio's, Personal 9/11 Statements, and/or other locations on our website, are not necessarily those of AE911Truth.org, Architects and Engineers for 9/11 Truth, Inc., its Board Members, employees, volunteers, other supporters, or any other people officially or unofficially associated or affiliated with AE911Truth. I remember during my verification interview that this may happen, but the more I sit with it, I no longer wish to be a supporter of your organization. Please remove me from the petition. I hope that someday your organization can be more open-minded about the evidence and occurrences on that tragic day. I for one do not know for sure what happened on that day, but in the interest of truth and evidence I believe we should consider insightful evidence that your organization is looking at as well as the evidence Dr. Wood has presented in detail and in a very professional manner. I have also read your "about us" page many times to see if I had missed something before signing the petition and I find it ironic that your first bullet under "our organization is devoted to" is "dispelling misinformation with scientific facts and forensic evidence".http://www.ae911truth.org/en/about-us.html From what I have read in Dr. Wood's book she has done just that, but I also see that your organization has taken a strong stance and have decided her work is "disinformation". Because of this, again, please remove me from your petition. I wish us all well as we move forward towards truth and hope that one day we can meet up again as one voice. As someone I look up to says often, "be skeptical, but don't close your mind"... that is my wish for us all. In short we reserve the right to edit or alter statements, which is mentioned as well. We do this anytime Judy Woods is mentioned [emphasis added] among other distracting topics. More to the point, we stay open-minded to science. That is why we don't stay open-minded to the "science" of Judy Woods presentations [emphasis added] which have changed immensely since her rising to the scene. From radiowaves to mini-nukes; whatever catches a readers attention with wild photos and claims. Please feel free to continue your investigations into the events of 9/11 and remember that we will welcome you back anytime. Note, my work has not changed. I have only added more detail as it became available. This is documented in my submission to NIST in March 2007, which was before ae911truth.org first put up their website and then made a submission to NIST. An organizaton that bans discussion of the truth while promoting disinformation brings into question their agenda. 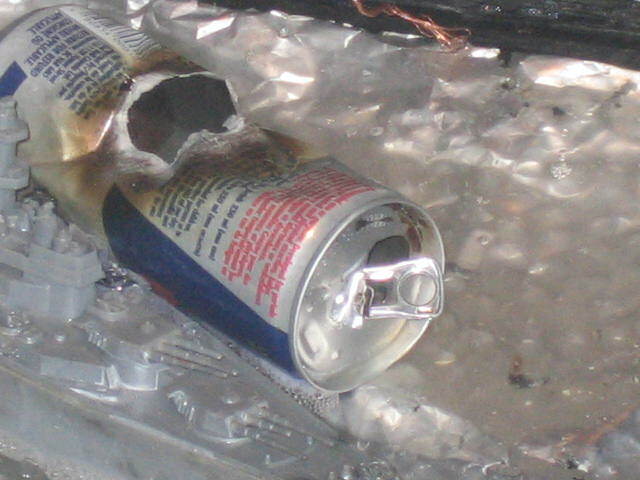 AE911Truth FAQ #6: What's Your Assessment of the Directed Energy Weapon (DEW) Hypothesis? During a May 8, 2011 interview, Mr. Gage claimed I only address two phenomena in my book, which is incorrect. In his article, Mr. Gage (incorrectly) implies my book is about "laser beams from space" and references other articles that have "debunked" this issue. So the article is quite misleading in that it does not address what my book is actually about nor have any of the "debunking" articles address the material I present, either. There is nothing to refute as their article does not address the research in my book. They merely promote disinformation about my work. If someone has read my book and has misunderstood what is on each of the more than 500 pages in my book, they have lost their intellectual integrity. One must question the motivaton to discourage the public from looking at the evidence. What is their objective? Mr. Gage claims Dr. Wood overlooks the existence of nanothermite. Is this true? The first step in a forensic investigation is to determine what happened. What happened on 9/11 is not merely a case of belief. This is a crime that should be solved by a forensic study of the evidence. Before it can be determined who did it, it must first be determined what was done and how it was done. Until he has done that, nothing else has any scientific value. If someone makes the statement that I have overlooked this issue when this is not true, it brings their credibility into question. Mr. Gage claims Dr. Wood ignores or overlooks the existence of iron microspheres. Is this true? Please read Chapter 15 of my book (Where Did the Towers Go?) and then explain to me why you claimed the existence of iron microspheres was overlooked. Mr. Gage as been aware of this at least since May 8, when it was explained to him during a radio interview. (Three clips from that interview are joined together and linked here.) So it is troubling why Mr. Gage has continued to make this claim. May 8, 2011, Three clips from joined together from the Ralph Winderrowd Show. June 24, 2011, The description of the video: "In this video I question Richard Gage in Rotterdam on 24-6-2011 about Judy Wood's DEW hypothesis. What struck me most is his last words in answering my question." If someone makes the statement that I have overlooked this issue when this is not true, it brings their credibility into question. It is especially troubling that after being corrected, they continue to promote this falsehood. Mr. Gage claims Dr. Wood denies or overlooks the existence of molten metal. Is this true? Please read Chapter 13 of my book (Where Did the Towers Go?) and then explain to me what the evidence reveals. This issue has not been overlooked. Please explain how it can be 819°F at the location where firefighters are wading in knee-deep water. Figure 21. Thermal map excerpt taken September 16, 2001. Zone F was supposedly the largest hot spot. If someone makes the statement that I have denied or overlooked this issue when this is not true, it brings their credibility into question. There are numberous "debunking" articles that have been posted around the internet on various hit-piece sites, such as http://ae911truth.org/ and Journal Of Nine Eleven Studies (or JONES) . One might ask why they have chosen to spend their time presenting the appearance of "infighting" rather than submitting a Request for Correction (RFC) to NIST with their purported "evidence" as I have done with mine, and why they have spent their time writing deceptive and dishonest hit pieces on the only person who has filed a federal qui tam case to hold anyone accountable for science fraud covering up the destruction of the WTC buildings. Why haven't they spent their time filing a federal qui tam case with their so-called "evidence" instead of writing deceptive hit pieces? This is especially troubling and brings into question their organization's true objective. I have chosen to spend my time on determining what happened on 9/11, then submitting my findings to NIST in a Request for Correctsion (RFC), and subsequently filing a federal qui tam case seeking accountability for those who committed science fraud and covering up the crime of 9/11. Some of those covering up the crime know whose technology was used to carry it out. So, why would the organized "Truth Movement" spend their energy and time writing hit pieces on me instead of supporting this federal qui tam case? As of today (September 30, 2011) my book has been out almost a year. In that time, no one has refuted any of the information in my book. They cannot. It is empirical evidence. Much organized effort has been made to divert attention away from the evidence I have presented and to misrepresent it and to cover it up. Those spending their time writing hit pieces that create a false impression of my work, instead of addressing the evidence of what happened on 9/11, reveal their primary objectives in doing so. But we were there. Vehicle 219 wasdestroyed. Evidence of molecular dissociation and transmution, as demonstrated by the near-instant rusting of affected steel. Columns were curled around a vertical axis, where overloaded buckled beams should be bent around the horizontal axis. Eyewitness testimony of Scott-pak explosions in fire trucks and fire trucks exploding that were parked near the WTC. (CCD-BiB) = "Conventional Controlled Demolition" with "Bombs in the Building"
Figure 26. hurricane data: controlled environment? Fire cannot burn down a steel-frame structure. Fires don't often burn wood-frame structures such that they are leveled to the ground. Figure 41. Fire in Gorham, Maine. Figure 42. Wood panelling and paper don't burn hot enough to melt steel. Source: northlineexpress.com Figure 43. Can carpeting, office furniture, wood panelling, and paper fuel a fire hot enough to produce molten metal? Figure 44. These fires do not melt or significantly weaken steel. Nukes are associated with high temperature. Figure 57. 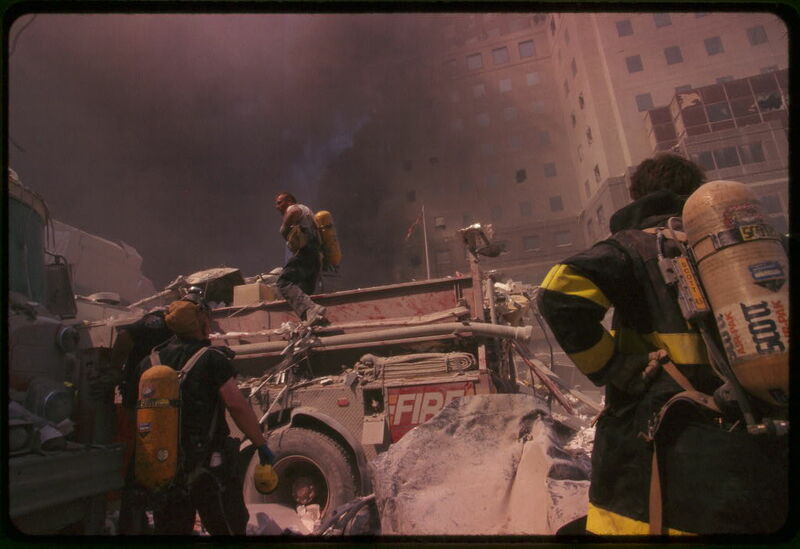 First rescuers under the WTC remains, "someone down there-there-there..."